Arising from the rubble of a mediaeval quarry, Barnack Hills and Holes is one of Britain’s most important wildlife sites. Covering an area of just 50 acres, its grassy slopes are home to a profusion of wild flowers and butterflies. This type of meadowland covered in wild flowers is now all too rare; half the surviving limestone grassland in Cambridgeshire is found at the site. The area became a National Nature Reserve in 1976, and in 2002 it was designated as a Special Area for Conservation (SAC), to protect the orchid rich grassland as part of the Nature 2000 series of special wildlife sites throughout Europe. Buses from Stamford and Peterborough serve local villages and stop regularly in Barnack. Please be aware that there are many steep slopes, and paths may be slippery and uneven on this site. The unique hummocky landscape of the Hills and Holes was created by quarrying for limestone. The stone, known as Barnack Rag, was a valuable building stone first exploited by the Romans over 1500 years ago. 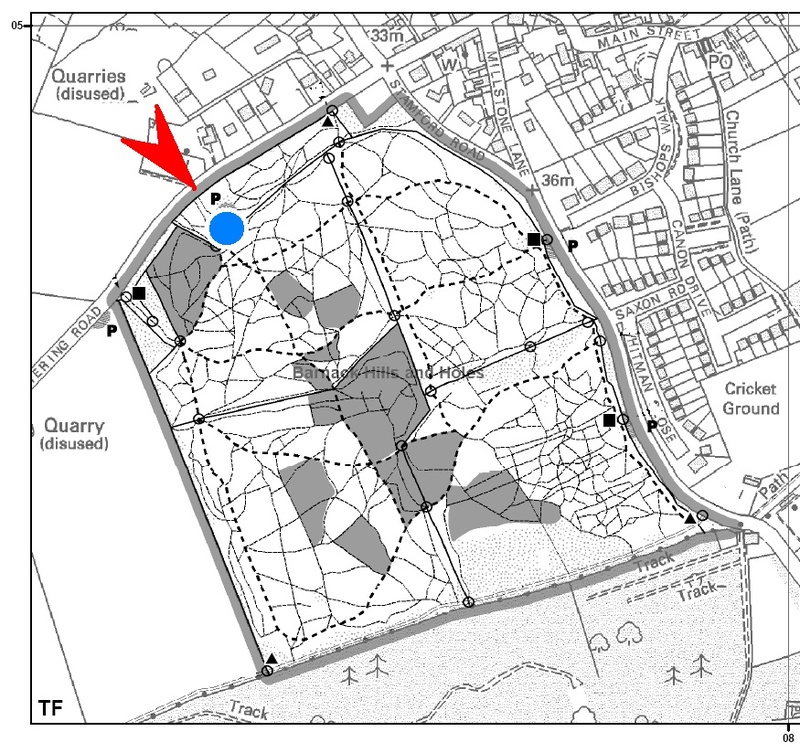 Quarrying continued in mediaeval times when the Abbeys at Peterborough, Crowland, Ramsey, Sawtry and Bury St. Edmunds all used Barnack stone, and the monasteries frequently argued over the rights to it. Blocks of stone were transported on sleds to the river Welland and loaded on to barges which travelled down the river Nene and other fenland waterways. Most famously, stone from Barnack was used to build Peterborough and Ely Cathedrals. By the year 1500, all the useful stone had been removed, and the bare heaps of limestone rubble gradually became covered by the rich carpet of wild flowers that can be seen today. The limestone was originally formed in Jurassic Times. It is made from the remains of billions of tiny sea-creatures which lived in a warm shallow sea that covered this area 150 million years ago. The area is often called the Hills and Hollows locally. Both names are widely accepted although Hills and Holes is the ‘official’ name. Barnack’s rich flora supports a wide variety of wildlife, especially insects, and a number of nationally scarce species are found. Several uncommon butterflies are recorded including marbled white, chalkhill blue, brown argus and green hairstreak. One of the most obvious signs of insect life are the many small mounds dotted across the site. These are the nests of the yellow meadow ant. The Hills and Holes are one of the best places in the region to see the strange green lights of the glow-worm, which occurs in large numbers on warm summer nights. The grubs of this beetle feed on snails, which are common on the limestone soils. Over 300 kinds of wild plant have been found on the Hills and Holes, including eight species of orchids. 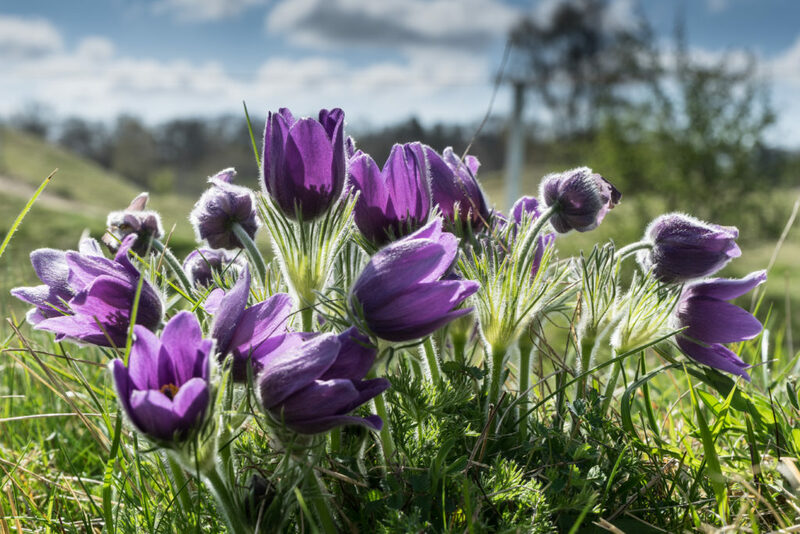 One of the rarest plants found here is the pasque flower, which blooms in April and May, alongside more familiar flowers such as violets and cowslip. The best time to see the flora is in June and July, when large areas are covered in pink, blue, white and yellow flowers. Many of the orchids appear at this time alongside other lime-loving plants including rockrose, wild thyme, quaking grass, and ox-eye daisy. Later in the year further species such as clustered bellflower, carline thistle, and autumn gentian may be seen. You may also notice the upright brown spikes of the knapweed broomrape, a parasitic plant which takes its food from the roots of greater knapweed. Nature reserves such as the Hills and Holes rarely look after themselves, and each year careful management is needed to maintain and improve the wildlife habitat on the Reserve. Limestone grasslands are traditionally grazed with sheep and at Barnack, grazing is carried out in autumn by up to 300 sheep. These remove the summer growth and build-up of leaves, stalks and grass tussocks that would otherwise die back to form a dead layer or ‘litter’ on the ground. Without grazing, the build-up of coarse grasses and litter would rapidly choke the rarer lime-loving plants. Parts of the grassland also suffer from invasion by scrub-an unwanted growth of shrubs and bushes, which if left unchecked, would rapidly take over the site. Scrub and trees are cleared regularly from the open grassland but a few areas are left as a habitat for birds and other wildlife. Natural England manages the site with help from local volunteers and the Langdyke Countryside Trust. Natural England declares National Nature Reserves to safeguard areas of outstanding importance for nature conservation. They also give the public a chance to experience at first hand a wide variety of wildlife and are important places for research and demonstration.